Referred to as a "shepherd in combat boots," Army Chaplain Emil Kapaun on Thursday received the Medal of Honor, more than 60 years after dying as a prisoner of war in the Korean War. During the Medal of Honor ceremony at the White House, President Obama called Kapaun "an American soldier who didn't fire a gun, but who wielded the mightiest weapon of all... a love for his brothers so pure that he was willing to die so they might live." 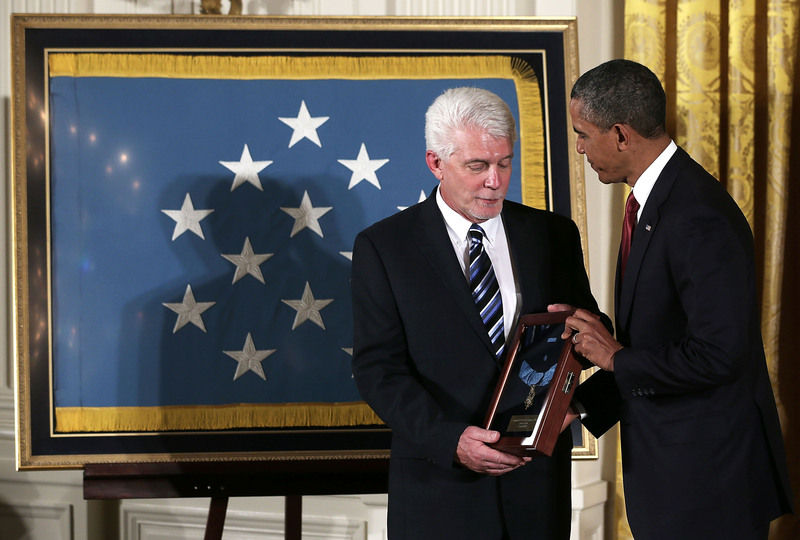 The Medal of Honor is awarded to a member of the Armed Forces who distinguishes themselves by going above and beyond the call of duty, and risking his life, while engaged in military action against an enemy. Ex-POW: Medal of Honor recipient "was a selfless man"
Kapaun displayed remarkable bravery while serving with the 3d Battalion, 8th Cavalry Regiment, 1st Cavalry Division. His unit was in Unsan, Korea, when it came under attack by Chinese Communist Forces, pitting approximately 20,000 Chinese forces against a few thousand Americans. Kapaun withstood enemy fire to drag his comrades to safety, and when his commanders ordered an evacuation, he chose to stay -- knowing he would be captured. The chaplain convinced a wounded Chinese officer to negotiate the safe surrender of American forces. Shortly after being captured, Kapaun bravely saved the life of a wounded American, pushing aside a Chinese soldier who was about to execute the soldier. Kapaun then carried that soldier four miles to the prison camp. The president described the way Kapaun helped his comrades, both physically and spiritually, on the journey to the camp and during the miserable days they were held captive. On Easter Sunday, Mr. Obama said, Kapaun led dozens of prisoners to the ruins of an old church in the camp, held up a small crucifix made from sticks and sang the Lord's Prayer and America the Beautiful. "They sang so loud other prisoners across the camp not only heard them but joined in," Mr. Obama said. The chaplain gave them the gift of hope, he said -- hope that "even in such hell, there could be a touch of the divine." After falling ill, his Chinese captors left Kapaun to die without food or water. Kapaun blessed his captors, asking God to forgive them. When his comrades were freed, they carried a crucifix they built in his honor. "Father Kapaun's life, I think, is a testimony to the human spirit, the power of faith, and reminds us of the good we can do each and every day regardless of the circumstances," Mr. Obama said. The Kansas-born chaplain's nephew and other family members were present at Thursday's White House ceremony, as well as leaders in the armed forces, the Catholic church and Kapaun's comrades who served beside him.